Harleyville, S.C. (WCIV) — Beidler Forest sits just off Interstate 26 in Harleyville. It’s the world’s largest virgin cypress-tupelo swamp. Musselman is in charge of every inch of all 18,000 acres of Four Holes Swamp. “It’s 60 miles, and it drops 30 feet. It's really winding,” he said. His place is to survey it all in five years, and that’s exactly what he was doing when he stumbled upon a piece of history swallowed up by the swamp. That’s when he spotted it—the tail section of a 1950s military jet. The wreckage of a United States Air Force reconnaissance plane crash. It crashed in January of 1957 and the remnants are still visible more than 60 years later. “A lot of it has been buried by decades of leaf litter and floods washing stuff over so there are more pieces than you see,” said Musselman. The tire, the front landing gear, and the plane’s tail section are now a fixture of the Beidler Forest. Musselman said there were rumors before his time as land manager about a plane crash in the forest, but no confirmation until he stumbled upon the wreckage last year. Then, he got to work using his background in history and the military to solve the mystery. He called Joint Base Charleston to get records of nearby crashes, but he said they came back empty-handed at first. He went back to the drawing board and back to the plane pieces to search for clues. By the end of the day the Air Force found the crash report. The plane took off from Shaw Air Force Base, approximately 8 miles from Sumter, S.C.
Two of the RF-84s were approximately 29 minutes into their flight when metal fatigue caused the fan to fall apart and the engine to no longer work. The pilot was John West, an exchange pilot from the British Royal Air Force. He survived the crash by ejecting and landed in the top of a tall pine tree near Highway 27. “He said the worst part of his experience was getting out of the swamp on the back of a tractor because he thought the farmer was driving pretty erratically,” Musselman said. The plane flew itself for four miles and crashed in the Beidler Forest. The wings were sheared off, scattering smaller pieces throughout the swamp. Musselman said there is about a 100-yard debris field. 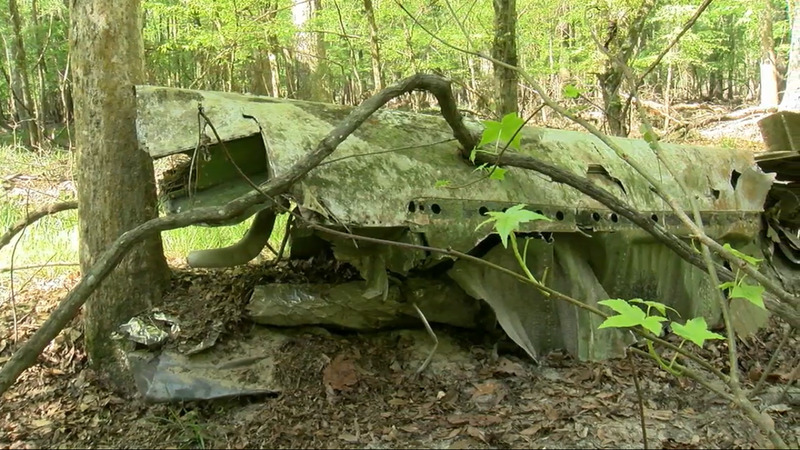 The Air Force hauled off some of the debris in 1957 and left the rest for Musselman to find. West died in 2008, leaving Musselman with some regrets. “It’s unfortunate because I could've found it in 2008, and that would have been neat to be able to show him at least some pictures of where his aircraft ended up after he departed it,” he said. West’s son is still alive, and Musselman hopes that one day he can show him the wreckage of the plane his father flew.